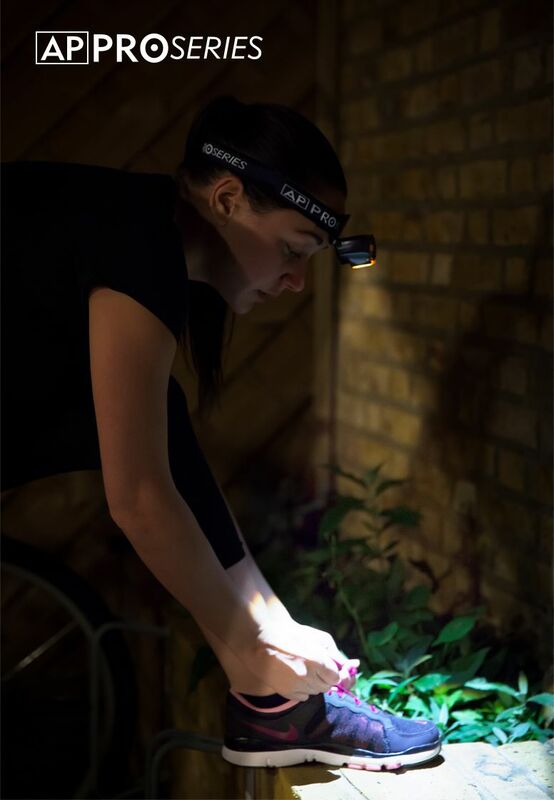 The Active Products Pro Series Head Torch is aimed at a very wide market, not only for day-to-day stuff like walking the dog after dark, or using in the garden, but more so for activities at night like walking, running and cycling. With a wide selection of modes this head torch promises to be very useful. I decided to give it a test in a night race. This is a single strap design and feels very comfortable, even whilst running the race with a sweaty head I didn’t have any real issues. It bounced around a little bit, but nothing that would cause an issue. Very easy to adjust and has a soft pad behind the light. This head torch takes three AAA batteries, which were supplied with the head torch. The battery life is said to be 8 hours, so far so good! There are some excellent modes on this head torch. When you press the on/off button the light comes on very bright, if you don’t need it quite as bright, you can hold the button down and it dims the light. Not only stopping blinding everyone, but also a great energy saving method. 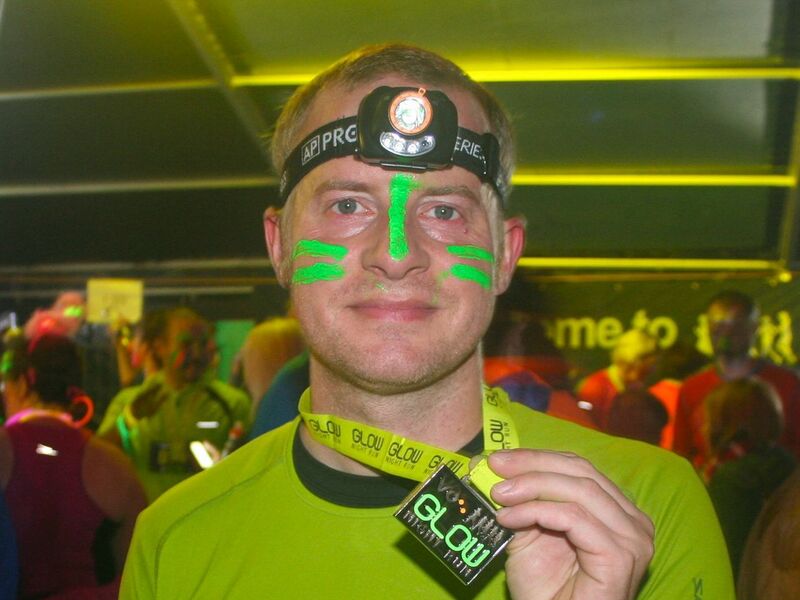 Whilst running the race, I had the head torch on full and it lit up more than just my way, I had a lot of comments about how good it was. Another mode is the on/off motion sensor, which can be set by pressing the other button the top of the head torch. You can then switch the light on and off by just waving your hand in front of the torch. No messing about when you have gloves on, or fiddling with buttons when you have your hands full. Loads of potential uses for this mode! Finally there is a SOS mode which can be set by pressing the on/off button twice. This flashes a red light, not important you might think, but you only need to rely on this mode once in your life to make it the most important setting on your head torch. Water Resistance The head torch unit is water resistant to IPX4, in simple terms is repellent against splashing water, good for UK conditions! 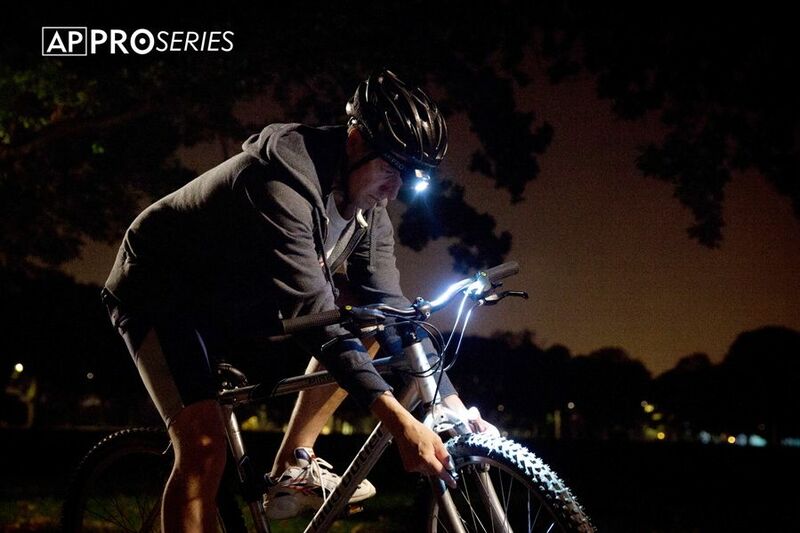 The CREE LED light gives off light 100 lumens in strength. What this in real terms, well pretty bright actually, you really don’t want to look at the bulb when its on! Apparently it has a beam distance of 55 metres, which I can believe. I was very impressed with the light is gives off and when using it, I felt in full control of the terrain under foot. The torch also has a focus control on the front which can either give you a spot light or a flood beam, up to 4X the width. Both very useful, and really handy as the terrain changes. The tilting head is on a toothed plate which gives you a nice bit of control on the tilt. I had to use this a fair bit in the race to avoid blinding people. The Active Products Pro Series Head Torch has a RRP price of £24.99 which is a very reasonable price for a head torch with so many useful modes. This also comes with a 3 year guarantee. This is definitely the brightest head torch I have used to date. I really like the way you can spread the beam to light up more of your surroundings, but concentrate it down to a beam when the terrain becomes more difficult. It’s comfortable to wear, looks great and so far the brightness hasn’t dropped! The modes are all very useful and being water repellant makes this a great all round head torch. Loads of usage potential!